The weekend will not be denied. This week, Perks is bringing you a Week of Transformation: all-access rejuvenation for your mind and body at Exhale Spa at Epic, all for 65% off. Also: half off your next pair of cult selvage denim jeans, fresh from the Denim Design Lab. It’s modern-day jean science, with a dash of old-timey alchemy. A little jean alchemy goes a long way. Tonight is your chance to check out F1RST Surf Shop’s gleaming new store, just opened across from the ocean in the Continuum building. Even if you don’t need a pair of boardies or a wet suit, we think you’ll like the gratis wine and rum cocktails. Pork belly sliders, fresh-shucked oysters and endless wine await you tonight at what is the restaurant equivalent of speed dating, also known as Taste of the Nation. This is your opportunity to sample unlimited small plates from more than 40 of the city’s finest eateries, including The Forge, Soleá and Meat Market. We hope you skipped lunch. Yes, this is in a strip mall in Hallandale. But there’s good news: the chef has clocked time at NYC’s Eleven Madison Park and Miami’s Table 8. And she’ll be serving you Scandinavian delicacies like Knödel (potato dumplings), Confit Chicken Wings and Artichoke Ravioli. No one is above the strip mall. 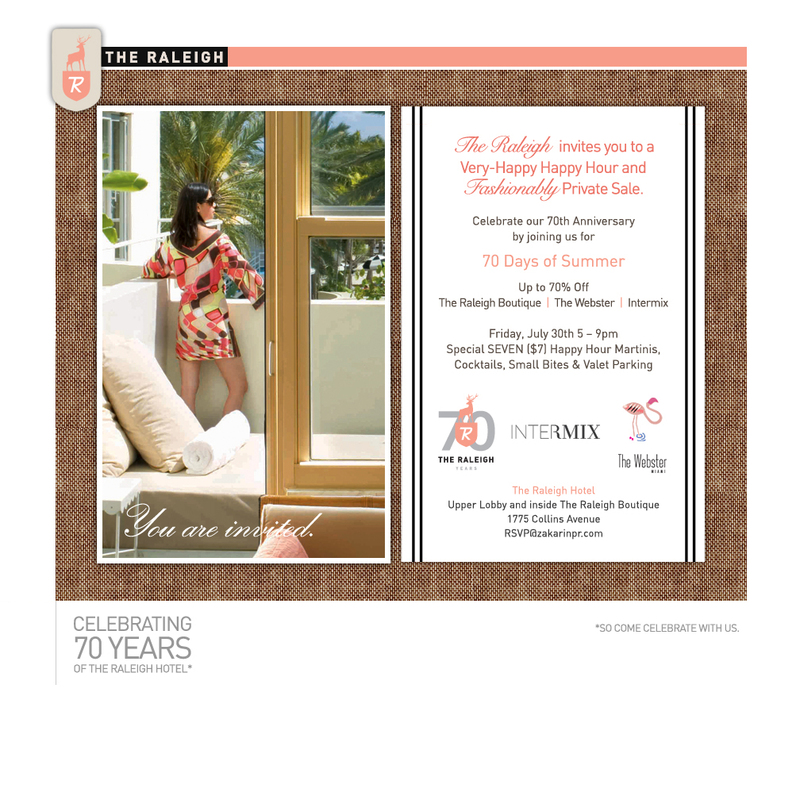 The Raleigh Hotel is slashing prices by 70% at its clothing store on Friday, and the Webster and Intermix are also bringing stuff over. So expect to find big discounts on things like Spurr jeans, Prada shorts and James Perse tees. And while you’re there, grab a drink—martinis, bar bites and valet are all $7. We know you’re always looking for a good inexpensive date spot, so here’s one for you: every Sunday in August, starting this Sunday, you can stroll through the resplendent Fairchild Garden for free. You’ll be saving about $40 for two tickets... put it toward a killer picnic basket. Or maybe some high-class sunblock.